For more than two years, as a college student, I worked for a public library. The best part of that job was when, every few weeks, I got to empty a giant bin of books into the recycling. These books were damaged or out of date or donations for which space couldn’t be found. If you’re the book-loving type that might sound kind of depressing, but the reality is that not every book can live forever. The upside for me was that I was free to pluck whichever books I wanted from the ‘Marked for Destruction’ pile. One of the books that I kept was an old, musty copy of Arthur C. Clarke’s 2001: A Space Odyssey which, if I’m being totally honest, I didn’t realize was a book until I was holding it in my hands. 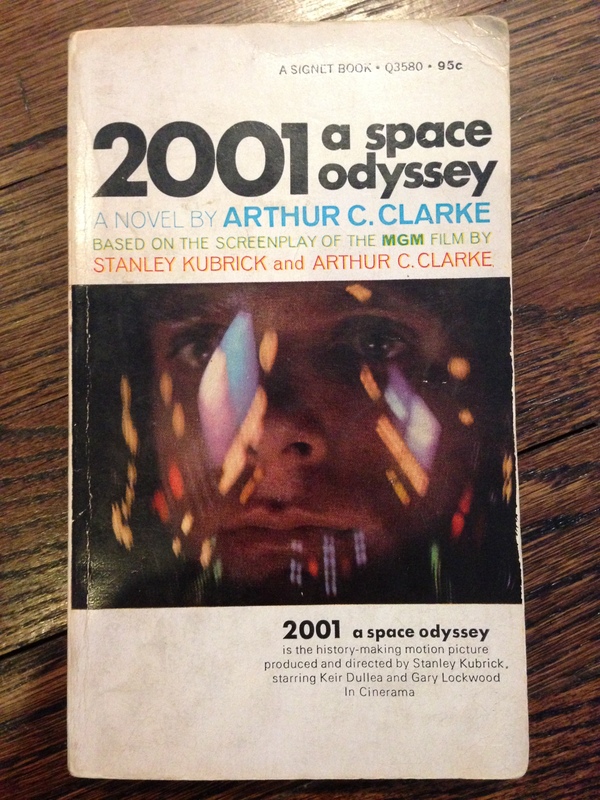 2001, the novel, was written by Clarke at the same time that he was writing the screenplay for the film of the same name (the screenplay – and apparently the novel, too – was written by Clarke with contributions from director Stanley Kubrick). It’s been a long time since I’ve seen the film version. At this point all that I really remember are a murderous spaceship and some chimps going bananas around an obelisk. I absolutely love Clarke’s Childhood’s End, though, so I figured it was about time I got around to reading 2001. 95 cents! That seems like some kind of sick joke, Signet. The book is, somewhat predictably, very good. Clarke is obviously a master and I’ve always had something of a soft spot for mid-20th century science fiction. What makes the book particularly interesting, though, is how it expands upon the universe of its sister-film, seeing as that film is so concretely established in our collective cultural consciousness. The aforementioned murderous spaceship persona, Hal (full name: HAL 9000), has long been considered one of cinema’s great villains. Hal’s an excellent foil in the novel, too, and some added background almost serves to make him – who the reader comes to see as something like a scared child lashing out – a vaguely sympathetic figure. You know, until he tries to kill everyone on board. Then there’s the book’s conclusion, which certainly contributes some clarification (of Clarke’s intent, at least) to the film’s mysterious ending. The film’s bizarre psychedelic sequence also gets some much appreciated explanation that ultimately can be reduced to the question, “How do you explain the inexplicable?” It’s a question that’s been asked numerous times before in literature and Clarke’s answer strongly resembles the one that Olaf Stapledon proposed with his Star Maker, which in turn resembled Dante’s vision of the Empyrean in The Divine Comedy, all of which read something like this: ‘It may be that there are things in existence so far beyond the scope of human comprehension that they completely defy description.’ I’d say that about sums it up. So if you’ve seen (and enjoyed) the film version of 2001: A Space Odyssey, Clarke’s novel is most certainly worth reading. And if not, it’s still a classic novel from one of science fiction’s most esteemed authors. And, you know, it’s a lot easier to understand than Kubrick’s wild film.